In some ways, this was a game of three parts. Barcelona took an early lead, and looked like suffocating United with their stability in possession. United gained momentum either side of halftime though, making Barcelona look nervous against the high press. Barcelona then managed to slow the game down again in the final stages to secure the win. Barcelona came to Old Trafford looking for a result to help them finally progress past the Champions League quarter-finals after a string of early exits over the last few years. Manager Ernesto Valverde went with the same lineup in a 4-3-3 formation as he did last time Barcelona played on English soil in their 4-2 win against Spurs at Wembley. This meant Nelson Semedo being preferred at right back to Sergi Roberto, and Arthur continuing to be trusted ahead of Arturo Vidal in big games. Unlike Barcelona – who had a tough title clash against Atlético Madrid to deal with at the weekend – United were able to have a full week of rest before this game. Ole Gunnar Solskjær decided to go field a back five in this game. Diogo Dalot unexpectedly played left wing-back, while Luke Shaw tucked in at left center-back. Fred played as the holding midfielder, flanked by Scott McTominay and Paul Pogba. Romelu Lukaku and Marcus Rashford acted as the forward pairing. Barcelona in possession against United’s medium-low block. Since the wingers tuck inside and the fullbacks play high up the pitch and act as wingers, Barcelona’s formation in possession resembles a 2-3-5 or 2-5-3, depending on if you count the fullbacks as wingers or midfielders. This is very much designed for stable possession against an opposition medium or low block. A low block refers to a team that retreats deep in their own half out of possession, generally only disrupting their opponents around their own box. A medium block refers to a team that retreats in their own half out of possession, generally only disrupting their opponents some way into their own half. The central midfielders rarely venture far ahead of the ball, which offers good protection for counterattacks. To advance attacks, a lot rests on the playmaking Lionel Messi drifting across the pitch to find pockets of space in front of, or behind, the opposition midfield. It is quite a conservative possession strategy, as when Messi drops deeper to get the ball, it is possible that Philippe Coutinho and Luis Suárez are the only two Barcelona players occupying spaces within the opposition’s defensive shape. In the opening stages of the game, this appeared to work for Barcelona. Against United’s 5-3-2 formation, Barcelona could essentially solve any pressure they faced in central areas through switching the ball out to the flanks, where teams in a 5-3-2 shape often struggle to generate pressure when they are defending. Sergio Busquets would also sometimes drop between his center-backs, removing himself from the pressing radius of United’s midfield. He also ensured that Barcelona should have a three-versus-two against any pressing attempts from United’s strikers. After twelve minutes, Barcelona were able to take the lead through what eventually went down as a Luke Shaw own goal. As with most decisive moments in the Barcelona attack, it was Messi with the biggest hand in the goal. A smart double movement to lose Shaw and run in behind the United defense allowed Busquets to find Messi in the box. His first touch took him slightly wide, but Messi’s chipped pass perfectly found Suárez at the far post. His header across goal took a deflection off the shoulder of Shaw on its way into the bottom corner for 1-0. 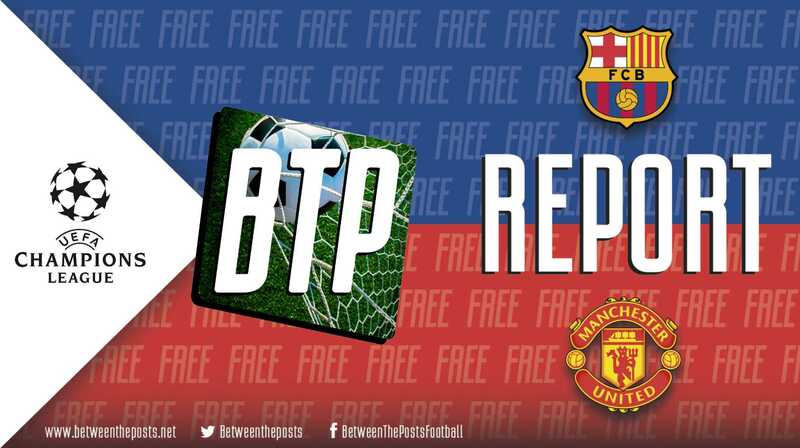 After their initial comfort, Barcelona ended up handing a large amount of momentum to United, because of their their inability to get out of United’s high press. This led to a cycle whereby they were constantly under pressure in their own half, making mistakes in dangerous areas close to their own goal. Barcelona’s structure to play from the goalkeeper, as usual, involved the center-backs splitting, and Busquets dropping in between. Against United’s medium block, Busquets had an easy job getting free when dropping between the center-backs. Against United’s high press, the midfield, usually Pogba, was given licence to push up onto Busquets to put pressure on. In these situations, United could match Barca man-to-man. The two strikers and Pogba took care of the center-backs and Busquets as the closest passing options. United’s wing-backs and central midfielders pushed up, leaving three-versus-three at the back. United also made good use of pressing triggers A pressing trigger is a specific pass or movement by the opponent that draws out a coordinated team press. to push the whole team up the pitch following backwards passes from Barcelona in order to force these high pressing situations where they could trap Barca in their own half. Despite this good pressing from United, it should be noted that the individual mistakes from Barcelona’s players, often relatively unforced, played a part in United’s dominance at this point in the game. United were nevertheless unable to fully take advantage due to their own poor use of the ball in the final third. The one-third of the pitch that is closest to the opposition’s goal. 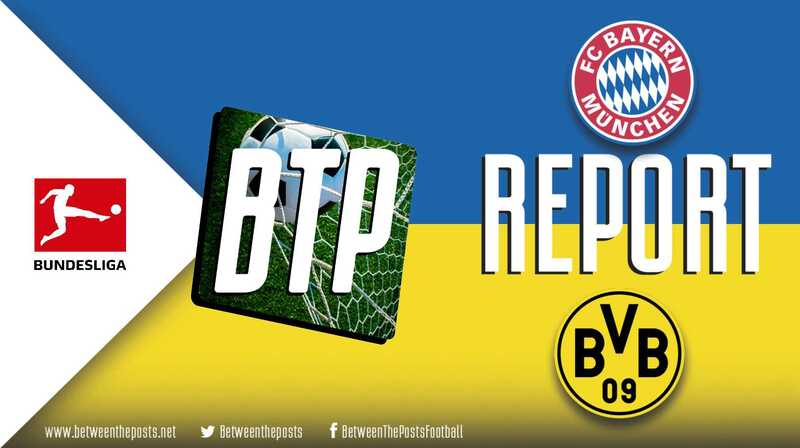 After the break, United attempted to carry on the momentum they had built up as the first half went on, pressing Barcelona at every opportunity and looking to exploit the apparent nervousness from Barcelona against this press. At this point, it was also increasingly obvious that Barcelona were struggling to get their key man Messi involved in the game. Aside from simply not being able to get the ball out of their own defensive third in order to get it to Messi, United’s defensive shape when they dropped deeper also made it difficult. The central presence provided by their 5-3-2 shape made the areas in front of the penalty box that Messi loves to exploit very difficult to access. Messi, especially with very little support near him due to Barcelona’s fairly unadventurous possession structure, often found himself getting crowded out. After the hour mark, Valverde clearly decided a change was needed. The obvious candidate for a substitution seemed to be Busquets. He was already on a booking and had committed other fouls since then, and he had made notable errors. Instead though, it was Arthur who was withdrawn from central midfield to be replaced by Sergi Roberto. Furthermore, Coutinho was replaced by Arturo Vidal. Barcelona in possession after Valverde’s changes. 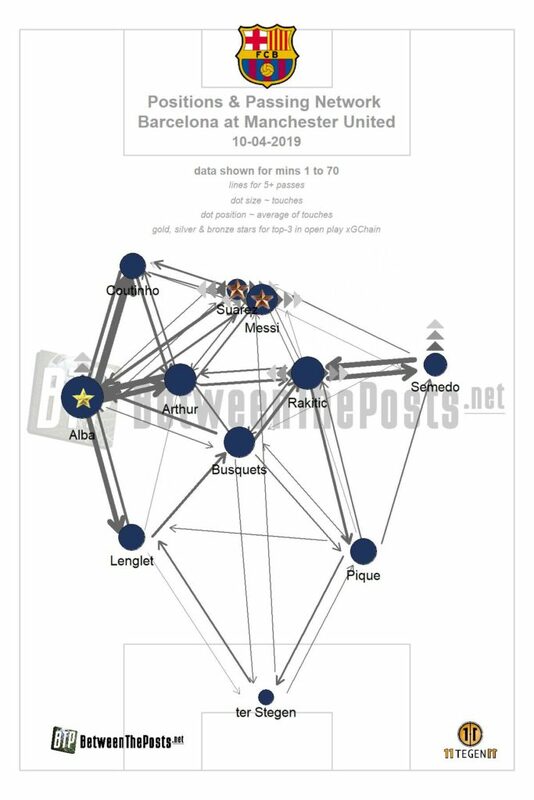 With these subs, Valverde was bringing on players who may not be at the technical level given by Coutinho and Arthur, but instead offer increased mobility with and without the ball. Although they had defended in what was essentially a 4-4-2 shape when Coutinho and Arthur were on the pitch, they were now playing from what is closest to a 4-4-2 formation in possession as well. Roberto had taken up the right midfield slot, Busquets and Ivan Rakitić partnered in the center, while Vidal was at left midfield. In possession, Busquets would still drop between the center-backs, with Rakitić just ahead of him. The two wide midfielders would generally move within the halfspaces, making forward runs if the situation was right, but rarely straying too far ahead of the ball. 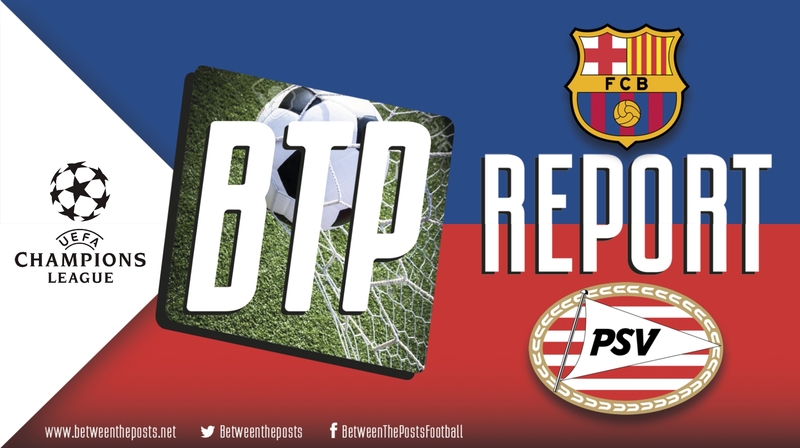 The midfield reshuffle, as well as probably some fatigue from United after their pressing throughout the game, helped Barcelona once again to regain some stability with the ball. 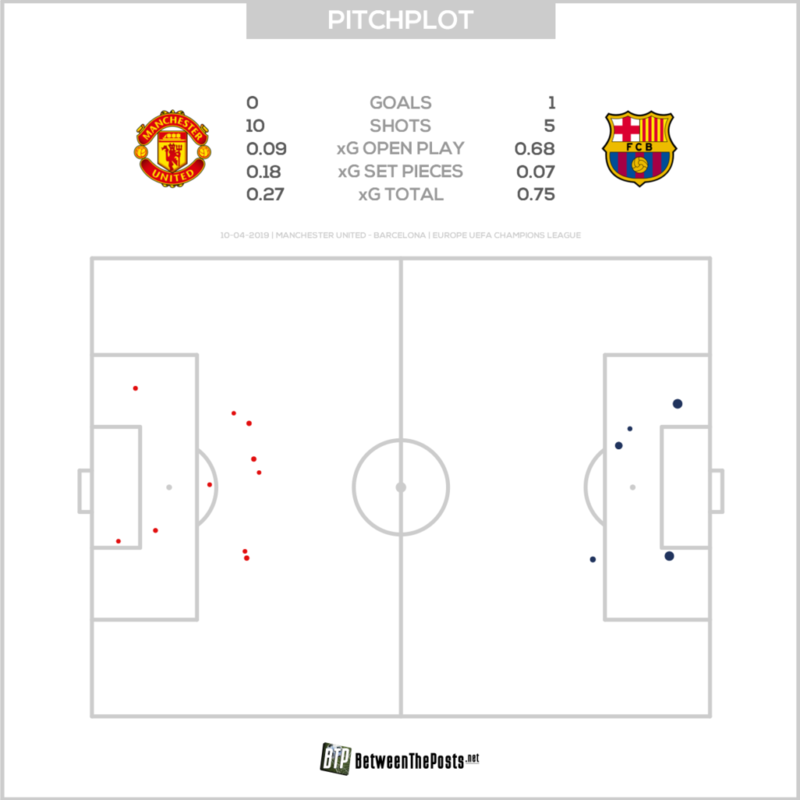 Barcelona still could not penetrate the congested center of United’s 5-3-2 formation, and instead focused themselves more on overloads and combinations on the wings to try and create the occasional breakthrough as the wide midfielders were supported by the overlaps of the fullbacks and Messi drifting into these areas. Of course, the main aim was to keep the ball for long spells, slow the game down and see out the 1-0, which is what they were able to do. With Messi not on top form and potentially still suffering the effects of a bang on the head from Chris Smalling, as well as other key players such as Busquets struggling at times, they would have been happy with the clean sheet. United’s pressing definitely had Barcelona worried for long spells during this game. The home side showed an energetic performance and physically looked dominant, but the lack of quality once they got to the final third would have been incredibly frustrating for Solskjær as his team failed to register a shot on target. From Barcelona’s point of view, the aforementioned way in which United were able to unnerve them with a high press is cause for concern in the future. Valverde deserves some credit for sensible substitutions which helped them regain some control over the ball, even if it was helped by some United fatigue. Barcelona will now surely back themselves to finish the task at home, and should be more physically fresh next time around with the opportunity to rest players in their weekend fixture at Huesca.